New stationary bikes can be used in place of a chair, allowing users to incorporate movement into their day. Loctek, a leading manufacturer of ergonomic office accessories, has launched a new line of desk bikes. The bikes function like a traditional stationary bike, but they are designed to be used while working at a desk. The modern workplace has evolved to make employee health and wellness a priority. However, there aren’t many seamless ways to battle the sedentary life of a computer user without completely upending a person’s normal routine. 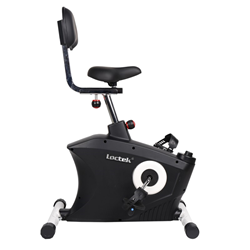 Loctek’s new desk bikes make it easy to insert calorie-burning movement into a typical workday. “Loctek has consistently provided solutions for computer ergonomics and now, with these bikes, we have another way to improve people’s overall well-being at work,” Loctek CEO Lane Xiang said. As the dangers of a sedentary lifestyle become more widely understood, people are getting educated about the need to move more throughout the day. Among the few innovative office products being introduced to deal with this problem, the desk bikes represent an excellent low impact option. Loctek's research has led them to the conclusion that riding a bike is the least distracting way to bring movement into the office. Desk bike users can casually pedal away while typing up emails or reading through documents. The new bikes are available in two designs. The U2 model has a sporty, contoured base and features a padded seat that can be adjusted both vertically and horizontally. The U1 model is referred to as an “X-bike” because its appearance resembles the letter “X”. It is lightweight and can be folded up for easy storage. The desk bikes can be used with most height adjustable desks and they are designed to operate quietly. Both models offer eight levels of resistance, so users can gradually increase their strength. The bikes also come equipped with an LCD display to track time, speed, calories burned and other achievements. Loctek designs and manufactures computer monitor mounts, sit-stand solutions, fitness products, TV mounts and other AV peripherals. Since 1998, Loctek has been producing innovative solutions to improve the safety, functionality and convenience of office workspaces.